The row boat is an example of mirror symmetric behaviour with forward and backward exchanged with respect to the boat and the rower. This corresponds to the situation an electron experiences when tunnelling from one atomic site to the other in a homonuclear diatomic molecule. It always sees both directions as wave-like superpositions, giving no hint as to which site it is travelling. 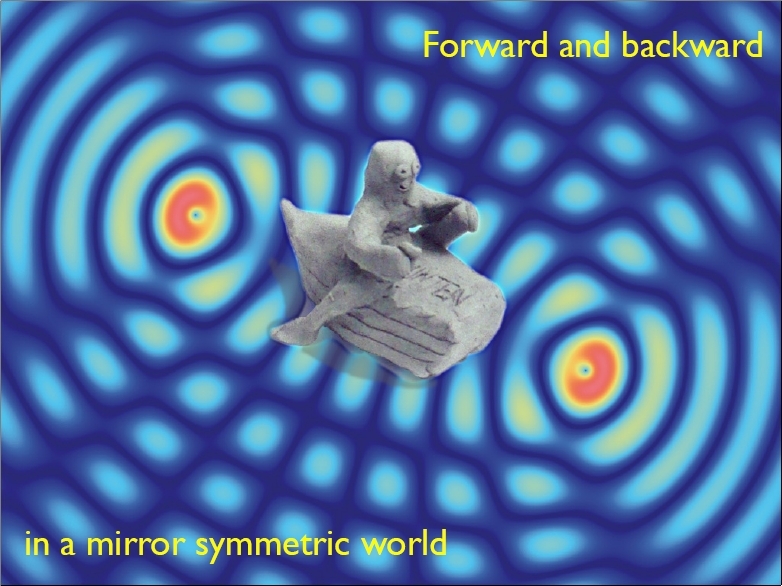 Only through a collision with one of the sites at high speed can the electron reorient itself in this mirror symmetric environment. Present address: Medical Faculty, Physics Department, University of Rijeka, 51000 Rijeka, Croatia. A situation analogous to the famous double slit experiment with single electrons1 arises when an electron is emitted from a homonuclear diatomic molecule due to the absorption of a highly energetic photon because the two atoms are mirror symmetric and indistinguishable2. Due to these two fundamental properties, the electrons can tunnel between the two atoms with an “overlap-specific” tunneling frequency. As a result, the electron is unable to distinguish from which atom it was originally emitted and instead shows properties of a coherent superposition of two waves which have been “simultaneously” emitted from both sides3. These superpositions may be distinguished with respect to sign, showing sum or difference properties. However, they reflect no specific properties of the corresponding individual waves. This coherent non-self-centred behaviour is even preserved upon scattering of the emitted electron by its neighbouring atom. The scattered electron is furthermore superimposed with the electron wave emitted from the neighbouring atom, but not with its own non-scattered wave. The corresponding superposition is, however, destructive due to the phase shift of π caused by the scattering process. In this way the amplitude of the original wave changes but its coherent character is, however, basically preserved. The electrons remain part of a coherent, non-self-centred environment. Is this principle of coherence conservation valid for all electrons, the scattered and the non-scattered ones, independent of their corresponding energies? For this purpose they irradiated nitrogen molecules over a wide photon energy range with monochromatic soft X-ray radiation from beamlines of HASYLAB at DESY in Hamburg and BESSY in Berlin. This gave rise to emission of photoelectrons with correspondingly different kinetic energies. The intensity of these electrons should oscillate with kinetic energy in a way expected for a coherent superposition of two waves emitted from two spatially separated positions. This should be the case for both the unscattered as well as the scattered electrons. Unexpectedly, the coherent behaviour appears for the latter one only for kinetic energies corresponding to a matter (de Broglie) wavelength larger than the distance between the two emitter atoms. For matter wavelengths smaller than this distance the coherence between the two emitter positions is lost and the scattered wave is superimposed with its own unscattered wave in a self-centred way. 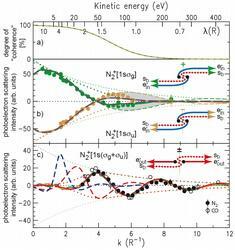 The results of these investigations have been published in the August issue of Nature Physics. In this context the question arises to why this dramatic change from cooperative coherent to self-centred explorative behaviour appears? The answer is the spatial resolution capability. As long as the scattered wave is unable to resolve the distance between the two emitter centres, the original coherence is preserved even in case of scattering. However, as soon as the matter wavelength becomes shorter than the emitter distance between the two atoms of the molecule, and is hence able to resolve this distance spatially in the sense of a Heisenberg microscope4, this coherence is lost. This position-resolving electron becomes re-scattered independently of the phase of the neighbouring atom and subsequently superimposes with its own un-scattered wave. This process, which modulates the absorption spectrum, has been known for many decades as “Extended X-ray Fine Structure”, abbreviated as EXAF5. The EXAFS analysis of the energy-dependent oscillating photoabsorption intensities forms the basis of one of the most successful methods for the structural analysis of condensed matter, because the self-centred behaviour of the scattered photoelectron yields detailed information on its environment. In our case it is sensitive to its spatially local environment because it has lost its original non-local coherent character and could collect information on its environment. In this way the German-American collaboration succeeded for the first time to demonstrate the transition from cooperative coherent to self-centred explorative behaviour of interacting particles, in this case of electrons, experimentally and theoretically. 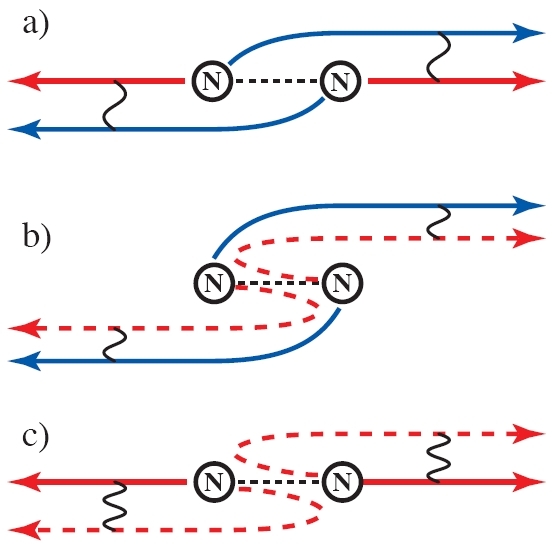 Figure 1: Electrons between cooperative (coherent) and egocentric behavior: If an electron is catapulted out of a nitrogen molecule at relatively low speed, it behaves cooperatively. The waves are sent out like a pseudo pair from both atoms and are superimposed coherently (a). 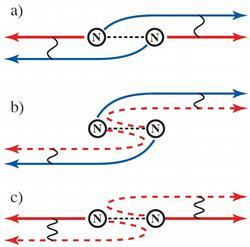 This also remains the case so if one of these electron waves is scattered off the atom (b). On the other hand, an electron behaves egocentrically or like an individual if it leaves the molecule quickly (c). If the electron now hits the adjacent atom and is scattered by it, it recognizes from which atom it started and superimposes itself on its non-scattered wave. Figure 2: The transition from coherent to non-coherent individual behavior is given by the “decoherence” curve6 shown in part a) of this figure. This curve shows the nearly complete degradation of coherent behavior upon scattering for a de Broglie wavelength matching the bond length R of the nitrogen molecule. Part b) of this figure shows the strength of the coherent superposition between the scattered and unscattered electron wave in the coherent two-centre scattering regime. It clearly shows how this regime dies out above the critical de Broglie wavelength = R. In place of this process, the individual self-interference of the scattered electron with its own unscattered wave becomes the dominant process. This process resolves its environment and hence provides structural information on it. Jönsson, C., Elektroneninterferenzen an mehreren künstlich hergestellten Feinspalten, Z. Phys. 161, 454–474 (1961). 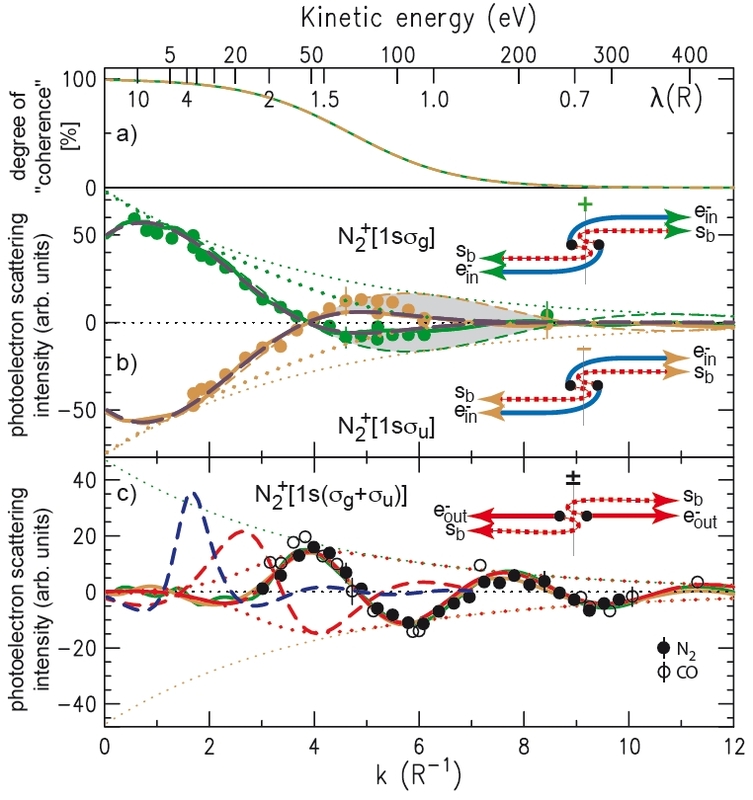 Rolles, D. et al., Isotope-induced partial localization of core electrons in the homonuclear molecule N2, Nature 437, 711–715 (2005). Cohen, H. D. & Fano, U., Interference in the Photo-Ionization of Molecules, Phys. Rev. 150, 30 -33(1966). Heisenberg, W., Über den anschaulichen Inhalt der quantentheoretischen Kinematik und Mechanik, Z. Phys. 43, 172-198, (1927). Sayers, D.E, Stern, E.A., and Lytle, F.W., New Technique for Investigating Noncrystalline Structures: Fourier Analysis of the Extended X-Ray-Absorption Fine Structure, Phys, Rev. Lett. 27, 1204-1207 (1971). Hackermüller, L., Hornberger, K., Brezger, B., Zeilinger, A. & Arndt, M. Decoherence of matter waves by thermal emission of radiation. Nature 427, 711–714 (2004).